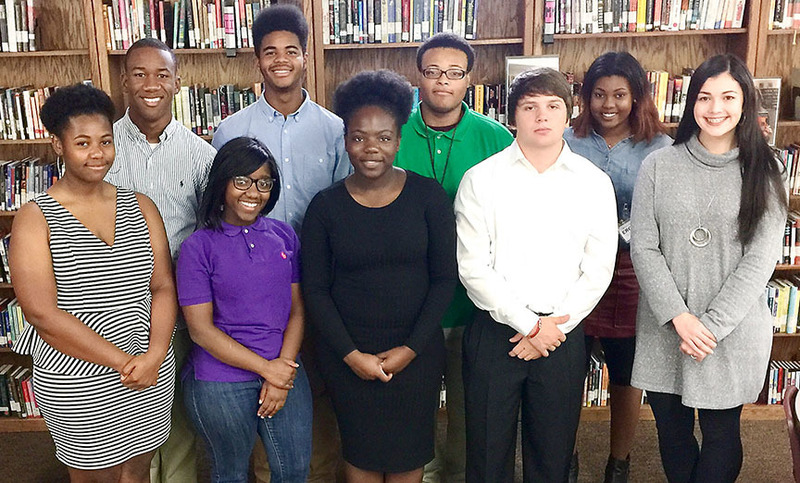 Blytheville High School student ambassadors for the 2016-17 school year include (front, from left) Lydia Lewis, K’najra Buckley, Maya Wells, Hollis Abner, Katie Beth Pankey, (in back, from left) C.J. Bell, Reginald Amerson, Kentrell Bobo, Mahogany Wells, (not pictured) Brooke Childs, Shynecia Hughes and Brandon Harvey. The Student Ambassador program was started by New Tech director Robin Snead and counselor Emily Crosskno earlier this semester after they visited other New Tech schools and saw how positively it was working for those schools. The individuals who are Student Ambassadors at Blytheville High School lead tours for various groups and individuals because they are such good speakers, they research what they’re talking about and memorize certain facts regarding the educational programs within BHS. BHS will host a New Tech Training Site Institute in January, and Snead’s idea is that the visitors be taken on a tour with students who have actual experience with what is happening at the school. The list of Student Ambassadors includes K’najra Buckley, Brooke Childs, Shynecia Hughes, Kentrell Bobo, C.J. Bell, Mahogany Wells, Katie Beth Pankey, Maya Wells, Hollis Abner, Reginald Amerson, Lydia Lewis and Brandon Harvey. Each student must have a recommendation from a teacher or counselor to become a Student Ambassador, Snead added. The student must also have room in his or her schedule to accommodate training, demonstrate proficiency in the Schoolwide Learning Outcomes, demonstrate an ability to greet visitors and make them feel welcome, and demonstrate the ability to memorize facts about BHS New Tech. The responsibilities of a Student Ambassador are to greet visitors to the campus with a professional, but friendly, tone and lead guided tours across BHS. As the student leads the tours, each must be able to discuss the school’s history as well as current changes, research and describe recent awards and club events, be able to describe New Tech, the ECHO online learning management system and project-based learning and give personal examples of experiences as a BHS New Tech student. In October, the student ambassadors led tours for the BHS Class of 1991 and Class of 2006 members. In the short time the Student Ambassadors program has existed, Snead said the program has been great for both the students and the school. “It’s really new but the students want to see it grow,” she added. A next step for the Student Ambassadors is to invite them to sit in on a Student Voice Panel at the high school along with students who are currently on the Student Voice Committee, which is a small committee of BHS students who meet periodically with other area Student Voice Committee members at Arkansas Northeastern College. The BHS Student Voice Committee is directed by teachers Michael Davis and Kristy Brasfield, and those individuals will evaluate a student culture survey and organize an action plan that can help improve student culture, Sneed went on to say.